I’ve interviewed a lot of high profile chefs in my time and they can be, shall we say, a slightly temperamental bunch… Not so Chris Wheeler, executive chef at Stoke Park hotel in South Bucks, celebrity stalwart on TV’s Great British Menu and Saturday Kitchen and officially loveliest spinner of the gas decks I’ve met in years. 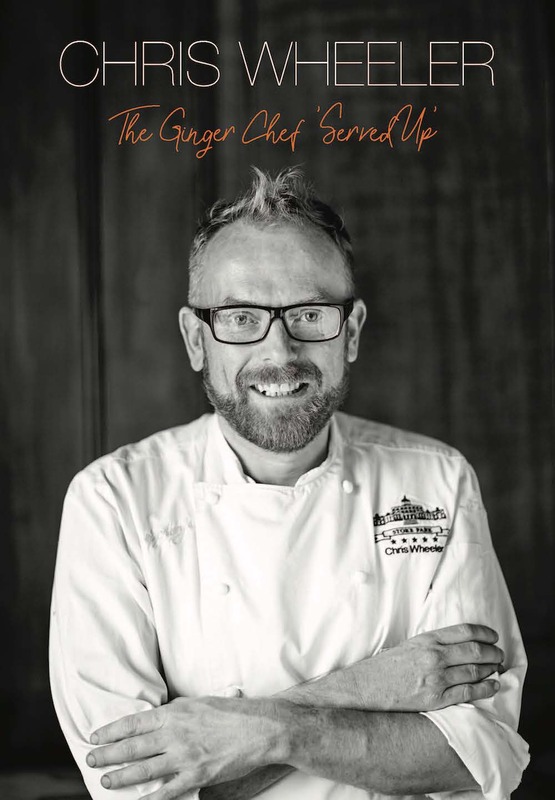 ‘Cheffy’ as he’s known at Stoke Park has just brought out his first independent cook book, gamely playing up his ginger creds as ‘The Ginger Chef’. Organised via starters, mains (fish and meat) and desserts, it’s designed to help ‘normal’ home cooks deliver something brilliant for family meals or dinner parties without having a culinary breakdown. There are gazillions of recipes, many of which suit autumn/winter (so a good time to invest in the book – a good Crimbo present maybe?) 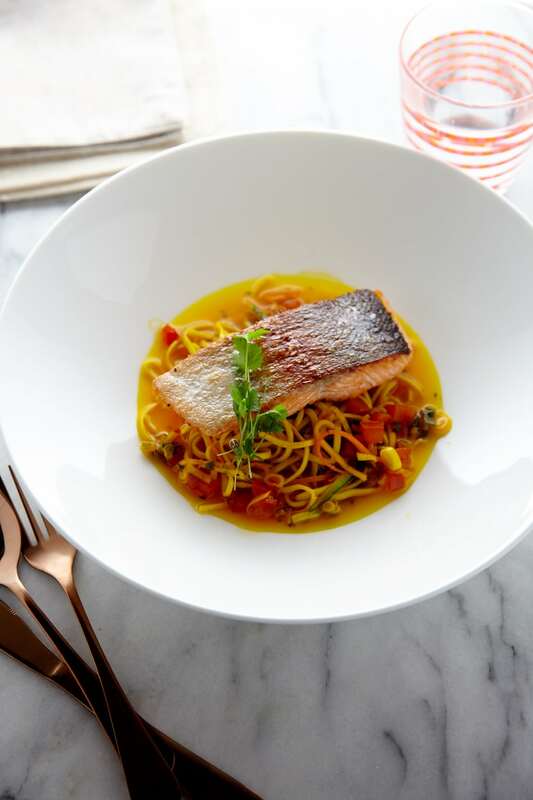 but this pan-fried sea trout with egg noodles, spring vegetables, chilli and saffron broth struck me with our heatwave on because it’s summery, light and frankly looks amazing. Wanna cook it? 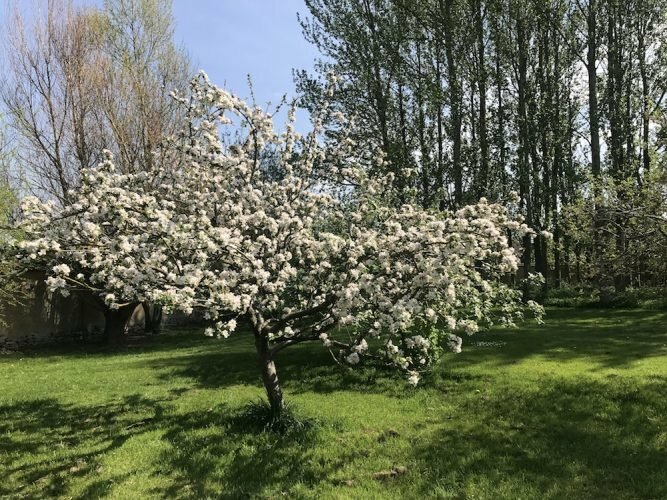 Go for it I’ll be round about 8pm with a bottle of riesling. 1. Pan-fry the sea trout for 4 minutes on both sides. 2. Blanch the egg noodles in boiling salted water and drain. 3. Place the fish stock and saffron in a pan and bring to the boil. 4. Slice the ginger, spring onions and chilli and add to the pan, simmer for 1 minute. 5. Cut the courgettes, carrots and mange tout into julienne (long very thin strips) and add to the pan, add the egg noodles and mix well, fi nely chop the coriander and add to the pan. 6. Using a roasting fork or tongs place a pile of the egg noodles and vegetable mixture in the middle of each bowl, place the sea trout on top and pour the broth around. The Ginger Chef ‘Served Up’ by Chris Wheeler is out now. Read my review of Humphry’s restaurant, where Chris Wheeler is Executive Chef.